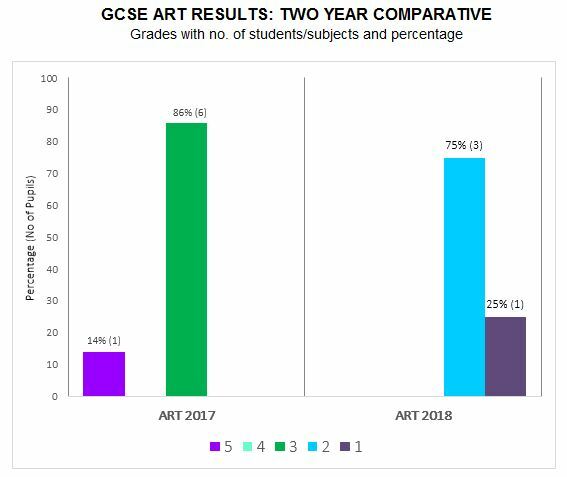 There were less entrant in 2018 (7) compared to 2017 (13) across GCSE Art and English but all students passed. Progress in Art was better in 2017 compared to 2018 due to significantly more challenging coursework which is reflected in the grades. Progress in English was also better in 2017 compared to 2018. There were seven more entrants in 2018 (95) 2017 compared to 2017 (88). 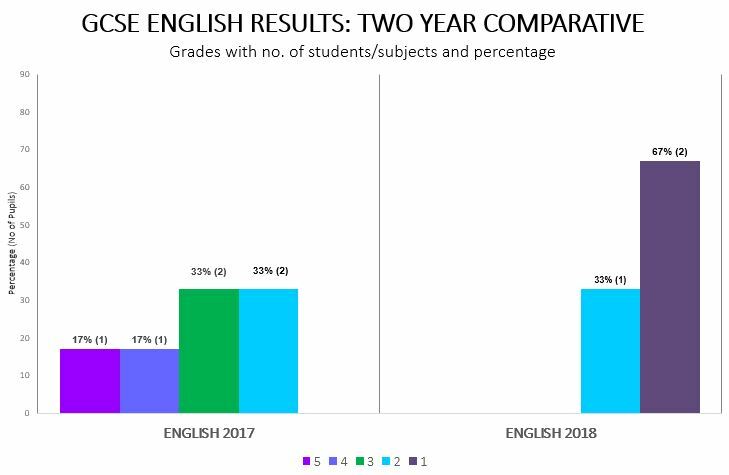 More pupils achieved entry level certificates in 2018 (92) compared to 2017 (73). in 2018, more pupils achieved entry level 2 certificates and significantly more achieved entry level 3 certificates compared to 2017. In 2018, 18 pupils achieved L1 Certificate in ASDAN Home Cooking Skills and 6 pupils achieved E3 in ASDAN Workright Employability. One pupil educated off-site achieved an E3 Building Qualification. Key Stage 4 students are given the opportunity to study a range of qualifications according to their ability. These include GCSEs and Entry Level qualifications. 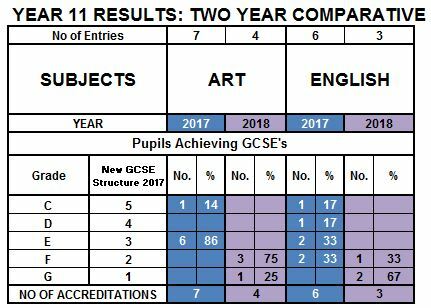 The Performance Tables give standardised information on the achievements of pupils in schools and colleges, and how they compare with other schools and colleges in the Local Authority (LA) and across England. Some information is however not applicable to our school e.g. Progress 8. In 2018, all students were in Post-16 provision. compared to 2017 were there was one NEAT (Not in Education, Employment or Training) students who had significant mental health issues hence not able to access further education. Please click on the icons below to find out more about the main Post-16 Providers for our school leavers. We work closely with the Careers and Enterprise Advisor Network who provide valuable links with champions of industry to engage our student in various ways to develop valuable insights into the world of work. After an initial diagnostic audit, some of our many strengths were identified which can now be used to develop our careers strategy and further embed work related learning across the school. We can now use the Gatsby Benchmarks (i.e. BM no.) to measure the impact of our careers program. In Key Stage 3 student have a stable careers programme which includes offering each year group an encounter with a local employer. This helps to broaden the students understanding of the skills and qualifications needed to meet the requirements of a local post (BM 1). The topics under study includes goals setting; employability skills etc. Students is Key Stage 4 complete personal and social development/Workright units that covers a selection of topics like interview skills; writing a CV etc. The full curriculum maps with more detail can be accessed here. We welcome our alumni to visit at various events to encourage current students to reach their potential (BM 5). Please refer to our Subject Access Statement, our Physical Accessibility Plan and how we Safeguarding our students by clicking on the relevant links . If you wish to discuss any of the matters related to Careers Education and Guidance, please contact our Careers Coordinator, Mrs. Jo Park. At our Post-16 Options Evening it was announced that there are significant changes to the Apprenticeship entry criteria that can potential benefit your child. Please click here for more information or download the Parent’s Guide to Apprenticeships.